Grease x1 - 30cm, or x2 - 20cm baking tins with butter and line with bake sheet. Soft self-raising flour and baking powder into a large bowl. Add the eggs, butter, sugar and vanilla extract. Beat with an electric mixer or wooden spoon. The mix should be pale and creamy; soft enough to drop easily off a spoon – add a small amount of warm water if required. Spoon the mixture into the one tin, or divide evenly into two tins if preferable. Bake for 30minutes. When ready, the cake/s should be risen and golden. The middle should be firm but springy. Leave for a couple of minutes before removing from tin. Slip a knife around the edge to assist if required and if not using a spring form tin. Peel off bake sheet carefully. Allow to cool on a rack. If using one tin, halve the cake using a long bread knife, cutting evenly around and sliding top half onto a plate. If using two tins, simply have these two sides ready to layer. 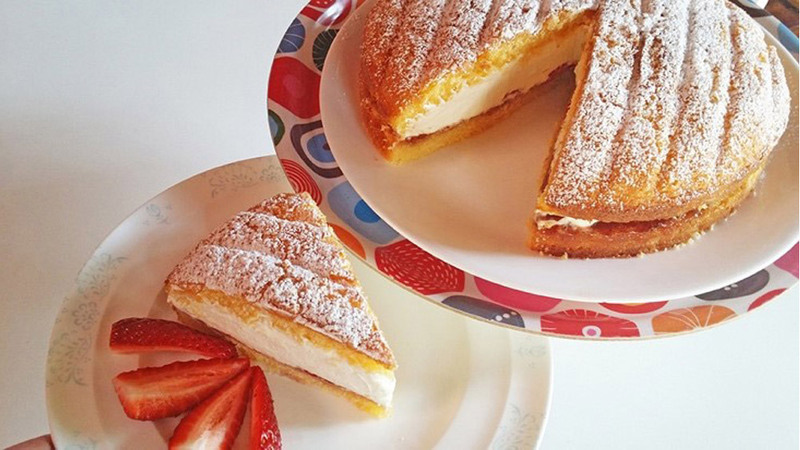 Spread bottom sponge half with jam and whipped cream, adding sliced berries on the jam if desired (it helps to add a mound of cream to the centre and this will disperse evenly around to the edges as the top layer added. Flip the top half of the sponge onto the cream layer, using a plate for assistance if required. Press top down very gently, sift icing sugar over, slice and enjoy! For a zesty lemon variation, add the zest of one lemon at the mixing stage prior to baking, then spread with lemon butter and fill with lemon curd.